Google's Android Auto system is gaining a bit of steam, but you still need to hunt for a manufacturer and model that support it (assuming you're buying a new car and not just upgrading your stereo). That will be a little easier later this year: in the lead-up to CES, American manufacturing giant Ford has announced that its semi-proprietary SYNC system will soon support Android Auto. Specifically, those cars that are currently on the road and use SYNC version 3 will be upgraded with Android Auto capability, and 2017 SYNC-equipped models should have Android Auto support built in. Android Auto support will come along with a host of other upgrades, including simultaneous support for Apple's competing CarPlay standard. To be clear, neither Android Auto nor CarPlay will replace SYNC - Ford's system will still be the primary user-focused electronic interface for its cars and trucks, with the phone-specific UI accessible as a sort of embedded app. Other apps are available on SYNC with or without a built-in data connection. The first 2017 model equipped with Android Auto support will be the Escape crossover SUV, followed by others (some with SYNC standard, some as an optional upgrade) later in 2016. Ford owners with a SYNC 3 system currently installed will need to apply a software update, though Ford's press release hasn't given a more precise date for its availability. 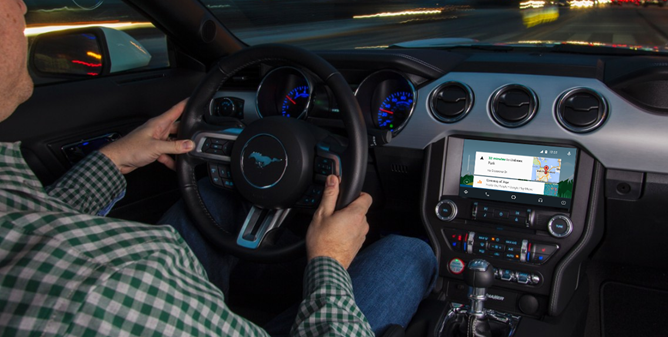 LAS VEGAS, Jan. 4, 2016 – Ford is expanding its SYNC® connectivity system, adding Apple CarPlay, Android Auto™, 4G LTE and several new AppLink™ apps to help millions of consumers stay connected behind the wheel and even when they are away from their cars. Ford Motor Company, a global automotive industry leader based in Dearborn, Mich., manufactures or distributes automobiles across six continents. With about 197,000 employees and 67 plants worldwide, the company’s automotive brands include Ford and Lincoln. The company provides financial services through Ford Motor Credit Company. For more information regarding Ford and its products worldwide, please visitwww.corporate.ford.com.